Wisteria – Just for flowers? Most articles and books refer to the fact that Wisterias are basically used as Bonsai just to show the flowers off. In contrast to this, Colin Lewis in Bonsai Basics (2008) makes the statement that Wisteria can make interesting trees even without flowers, at the same time acknowledging that it is the flowers that make them spectacular. 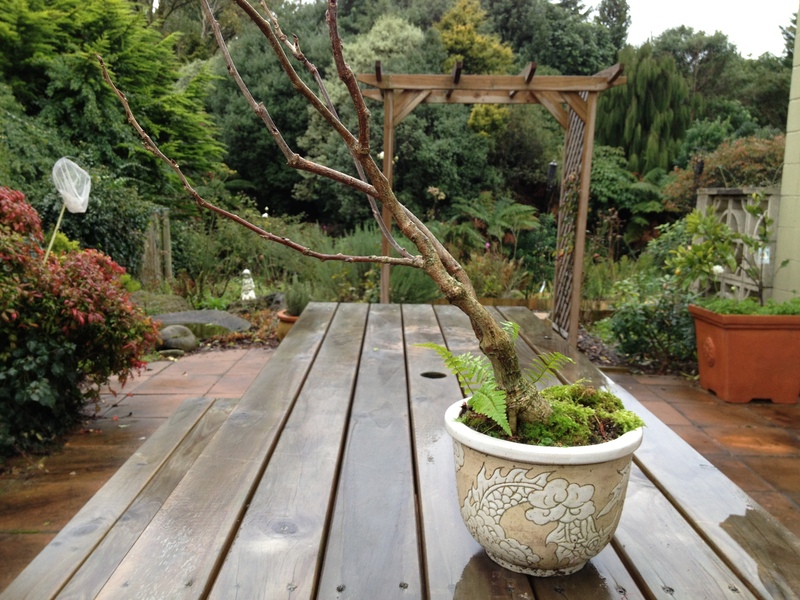 I find that these plants (climbers) do need to be taken care of in exactly the same way as most other deciduous Bonsai. 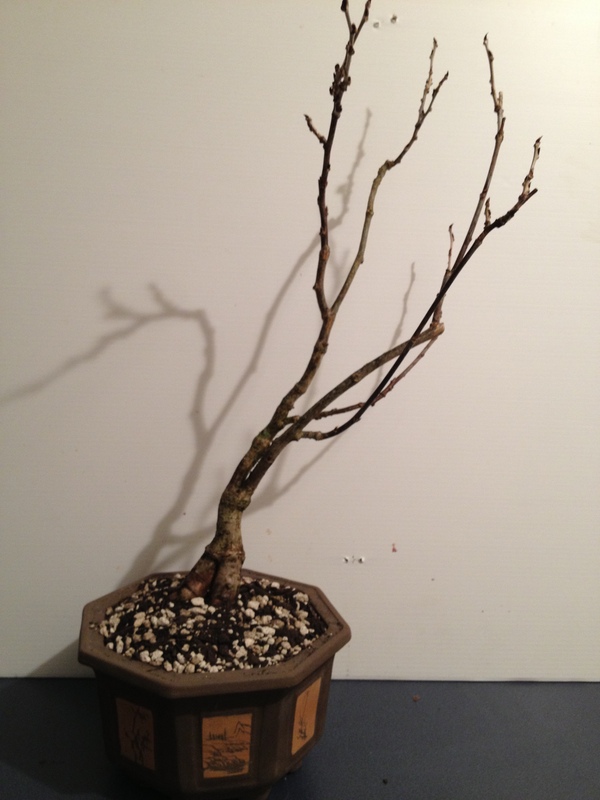 The tasks of potting, re-potting, pruning, root work, wiring and display is just as important for this species as for any other species of Bonsai. I have had a nursery bought Wisteria in a smallish pot for about two years now and recently decided to repot in a larger pot. This is mainly due to the fact that the roots have developed nicely and I am afraid that the smaller pot will not balance and weight the tree down enough when it comes into bloom again. 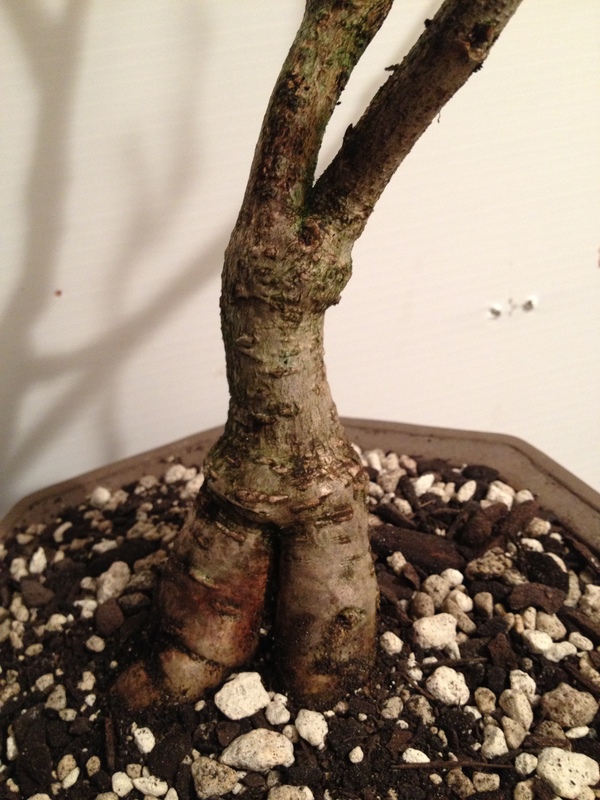 An article in Bonsai Today (96:2005) states that Wisterias reacts well to rootpruning. It also says that you can be quite fearless about cutting thick roots. This is exactly what I did when it came out of the nursery bag and as can be seen from the photo below, it has certainly grown a lot of finer roots. 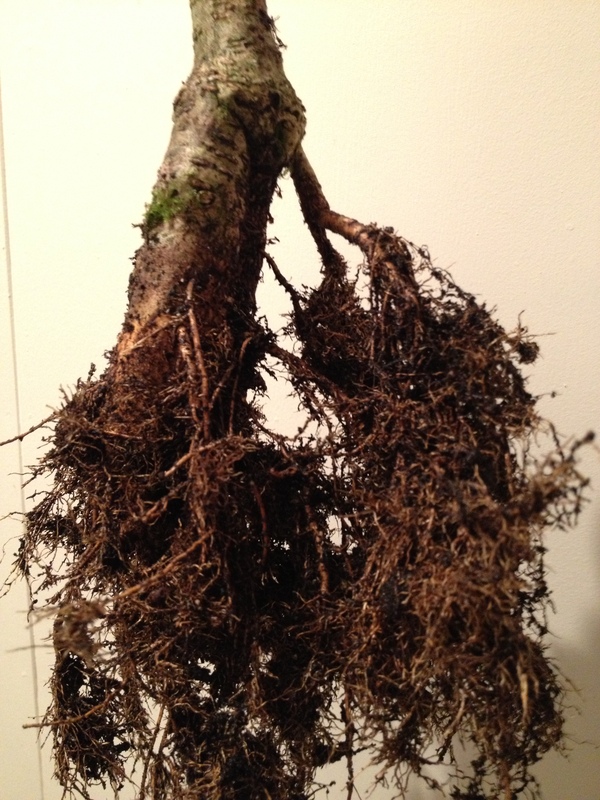 This article also warns against allowing the roots to grow too long as they easily become rootbound. I have decided to plant it in a hexagonal pot as it is difficult to determine a “front” for the plant. The context of this specific species changes as it goes through its growing season. In winter it is the bare branches, then the flowers and then the leaves with rampant, long branch growth, that needs to be kept in check. Herb Gustafson in The Bonsai Workshop (1996: 37) shows a Wisteria in a hexagonal pot that resembles my Wisteria quite well. In Bonsai Identifier (Owen, 1998:114) it is mentioned that pots for Wisteria will normally be glazed, sometimes decorated and heavy. With all of this information, the repotting session starts. 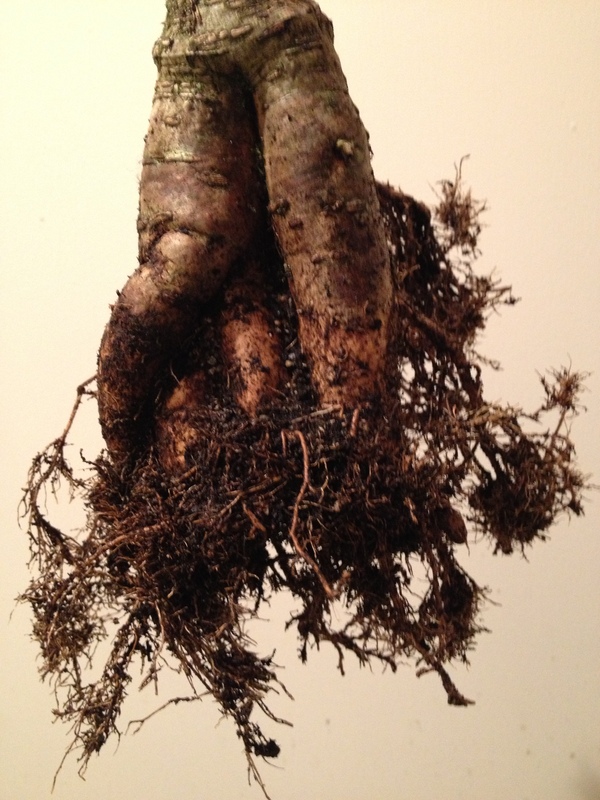 The roots as they came out of the old pot (left) and after some pruning (right). 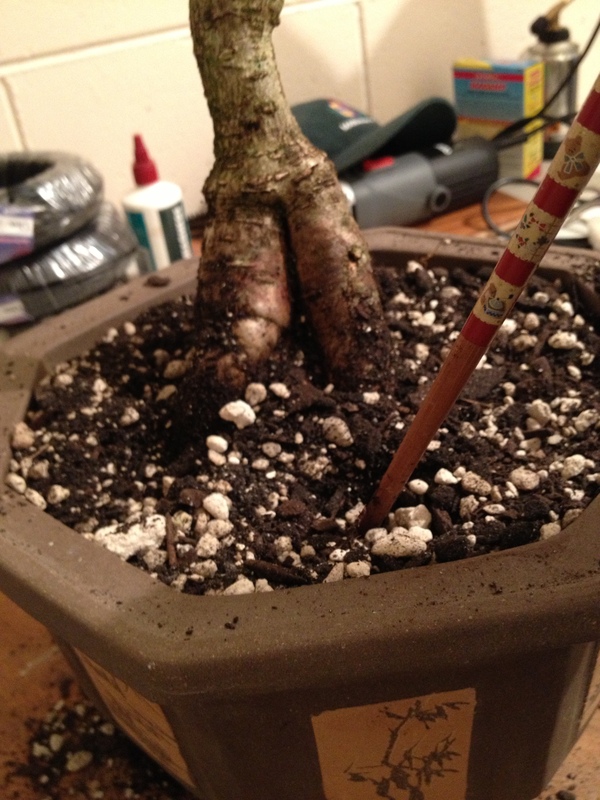 The plant is tied down and soil added and well worked into the roots with the aid of a chopstick. The finished job and ready for watering. Now it is a case of wait and see what it does when it is flowering time.